What single condiment has the ability to improve any food? Ketchup, of course. At least that’s how your kids might see it. If using fresh tomatoes, process them until they are simply juice. See the videos below for instruction. If starting with juice, proceed to step one. Combine all ingredients except for honey. Simmer till ketchup-thick, about 3-4 hours, stirring occasionally then more frequently as it thickens. The stirring will prevent burning. Add honey and heat a while longer to return to ketchup thickness. Stir frequently to prevent burning, lowering the heat if necessary. Remove from heat and puree with blender to smooth and incorporate remaining onion and garlic. 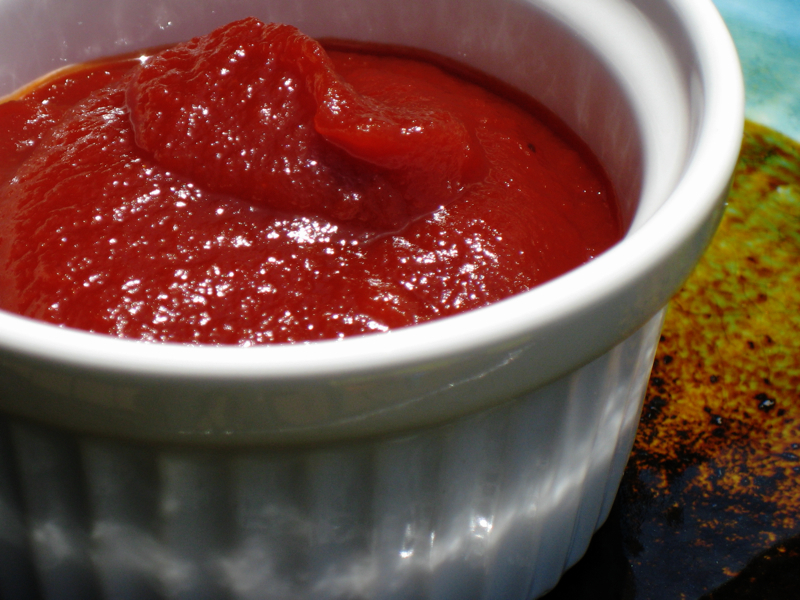 Ketchup will keep for a long time in your fridge. Make a large batch and process them in a canner to make it shelf stable for even longer storage. This video also contains info for using a food mill to remove seeds and skins from tomatoes. Why bother with the honey at all? If you’re using good tomatoes, you shouldn’t need *any* sweetener!! I would use apple cider vinegar in this recipe, as well. If you’re going to store it in the fridge, it will be just fine. Water-bath canning a few 1/2 pints of it will do, as well. Ditch the honey & cut the carbs! Tomatoes and white onion have plenty of carbs all by themselves. . . .
Hey, Reid. How did you start on the MucosaHeal? I am just recovering from a flare-up and am slolwy starting to add the Bifidum strain of the Natren probiotics. I am doing very slow on the probiotics since I have de-tox effects and do not want to make things worse. Do you think I need to be that slow on starting the MucosaHeal? I know my gut can give me the best answer to this question, but I just need to know how things have worked for other people before I try to add new stuff. Your website is quite helpful! Thanks for keeping it up!